Here is another picture of our great friend and companion Smokey. He is only 10 weeks or so in this picture. Me and my kids had just finished building a dog house for him when I took this great picture of my daughter and Smoke. Unfortunately I had to crop the picture a little to hide my daughters identity(crazy world isn’t it?) but I think it still makes a great picture. He is such a great protector now(2 years old) I know my whole family is safe when we are with him. As usual German Shepherds rule! 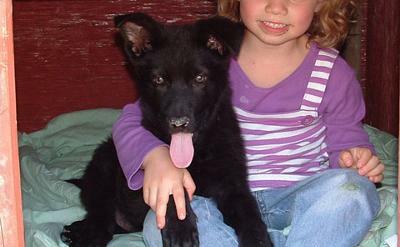 That is one cute black German Shepherd puppy and one cute little girl too! What a great picture, and no, I don't blame you at all for cropping it, you can never be too careful! I'll bet Smokey and your kids are as thick as thieves and what a great experience for the kids to have a puppy to play with and for the puppy to have plenty of playmates. You can't ask for much better than that. And if you get the chance, send us some updates from time to time to let us know how dear old Smokey's turning out! Thanks for posting here too - beautiful German Shepherd puppy!